Learn about the journeys of two organizations that set out to establish single-path coding. For University of New Mexico Hospitals (UNMH), it was a way to comply with the ICD-10 mandate while eliminating cumbersome paper superbills. For University of California San Diego (UCSD) Health, it was a way to eliminate duplicative processes and optimize productivity. The multifunctional "it" in both these scenarios is single-path coding, a consolidation of facility and professional fee coding that is slowly gaining traction among health care organizations seeking to streamline processes, maximize coder output, and reduce costs. Single-path coding is "a trend we've been watching for the past six to eight years as a result of our customers telling us they have two distinct teams looking at the same documentation," says Brooks Tingey, 3M's senior marketing manager for revenue cycle. "They ask, 'If both facility and pro fee coders are looking at the same documentation and need to identify the same procedures, why can't it be done by the same coder?'" • enhanced accuracy and productivity. Ultimately, Tingey says, "Single-path coding helps eliminate variances between professional fee and facility charges. … It eliminates the duplicate work of having two people looking at the same documentation and arriving at the same codes, and it also helps ensure you're capturing all modifiers and edits at the point of coding." For UNMH, a five-hospital system and the state's only academic medical center, single-path coding emerged as a solution to a multipronged problem for which the 2015 transition to ICD-10 was the catalyst. Specifically, the organization was using paper billing tickets in its outpatient clinics. These superbills were printed with the five most common diagnoses for each clinic, with a space to write in other diagnoses when necessary. Providers simply circled or jotted down the proper diagnosis and the paper ticket was then routed to the appropriate departments for entry into the various systems before being sent for coding. "We knew we were not going to meet ICD-10 diagnosis specificity with this paper process," says Catherine Porto, MPA, RHIA, CHP, UNMH's executive director of HIM. "Coders had been removed from the clinics with implementation of the superbill process many years ago, so we basically had no staff to begin coding for ICD-10 diagnoses for professional fee billing in 2015." Implementing a single coding workflow with one coder managing both facility and professional fee coding fit well with the 3M 360 Encompass computer-assisted coding (CAC) and clinical documentation improvement (CDI) platform that UNMH was preparing to implement. 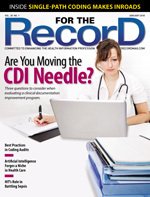 Making the decision to adopt single path in advance of deploying its CAC solution—which placed HIM in charge of both outpatient facility and professional fee coding—ensured that the coding software would include all documents needed for inpatient and outpatient facility and professional fee coding. It also ensured that the new CAC solution included "all the components we needed to meet the needs of today and in the future, with the inclusion of AHRQ [Agency for Healthcare Research and Quality] and HCC [hierarchical condition category], additional applications that will help us manage our overall coding and CDI programs and be positioned to move into value-based care models," Porto says. UNMH opted for a staged implementation beginning with diagnoses coding to meet the 2015 ICD-10 mandate. This allowed time to build out system automation for acceptance of CPT codes by both billing systems and work through issues related to workflow changes within the financial system. Plans also call for a revamp of charge master functionality in 2018. Coders have the opportunity to undergo hands-on training to expand their proficiency in both facility and professional fee coding. In addition to formal training to code all outpatient clinical services, the coding staff has been processing edits in two different billing systems since early 2015. The ongoing dual coding environment means "we are not seeing a positive impact in cost or coder productivity yet," Porto says. "Positive impacts today, we believe, are coders becoming expert users in the new technology, increased coder satisfaction, and diagnosis coding accuracy. "Future impacts we definitely see as increases in productivity, timeliness, and accuracy when coders are using the same coding systems to dual code in a single model modality." Porto is confident about future benefits because of UNMH's participation in a beta project for 3M undertaken in 2016 to test the efficacy of 360 Encompass System Professional, an expansion of the 3M platform to include professional fee coding capabilities. It's an example of the technology enhancements required to successfully implement the single-path coding model. According to Tingey, 3M began work on a single-path coding solution in earnest about three years ago, first by adding professional fee coding workflow to its 360 Encompass solution. This gave client organizations the ability to manage both professional fee and facility coding in the same CAC solution, albeit within separate sections. "That was the foundation for single path," Tingey says. "We've further modified [the platform] with a separate tab for those who choose to work in a single-path workflow. It can be configured so the system knows that a facility wants to use single path for certain specialties. It knows when coders are ready and brings that option into the workflow." That flexibility is important because most organizations won't undertake a complete transition to single-path coding—nor should they. Rather, implementation is based on which specialty service lines will benefit most. According to Tingey, it's best to start small and then scale up as coders become more comfortable with the technology and their proficiency increases. As such, the CAC platform should be able to function in a dual environment to avoid having to implement and manage multiple solutions. "The ability to autosuggest codes on both sides simultaneously is also very important," Tingey says. "It assists with education and expedites the learning process … then further enables the coder to be successful in the transition to a single-path coder." Technology is just one piece of the puzzle when it comes to a successful single-path strategy, according to Jenan Custer, CCS, CPC, CDIP, director of coding for Healthcare Coding & Consulting Services, a subsidiary of the Innovation Institute. "To me, this is process driven. It's really a process improvement model," she says. "It's taking multiple people involved throughout the coding process and consolidating the need down to one person. Ideally, without sacrificing quality and productivity." Therefore, creating an effective single path workflow is critical. Custer recommends mapping out processes by chart type coding to see where workflows meet or overlap. This will reveal which steps within the coding process can be combined—a final decision that should not be made without heavy involvement from the impacted coders. "There is often a disconnect between the process and what the coder does vs what upper management believes the process should be," Custer says. "It takes a high-level analysis of the workflow, including how it works with other departments like billing." Part of this workflow analysis should be an evaluation of coder proficiencies to identify the extent of training needed to ensure coders can concurrently code facility and professional fees. This will provide insights into just how far the process can be consolidated. Some facilities bring in charge capture along with coding, which may require additional interdepartmental training. Custer explains that it's critical to understand that the facility and professional sides of coding a single account are different skill sets. In fact, even among the elite, specialized coders, proficiency on "both sides" is rare. "Yes, single-path coding can be wonderful if you happen to have the right coders, system, and workflows. If you do not, however, have the magic combination—and it's not always easy to tell—you are almost certainly better off specializing if you have a large enough coding team. The real trick is determining which strategy best suits your unique situation," she says. Training should be followed up with ongoing quality reviews. "Ongoing audits are going to be key. I cannot emphasize that enough," Custer says. "Coders have a lot going on right now. It's an evolving, fluid profession, so if you're introducing new skills or new processes, the key is to monitor and audit." Raemarie Jimenez, AAPC, CPC, CDEO, CCS, vice president of member certification and development for AAPC, recommends taking training a step further to ensure coders are certified in both processes and "fully understand the differences and similarities for selecting codes for the professional and facilities services." Specifically, when it comes to training and implementation, she recommends that facilities "make sure coders have access to all systems and tools required to code both. Conduct a gap analysis of current coder skill sets to code both components [and then] provide training for the gaps identified [and] provide QA [quality assurance] to monitor accuracy and ongoing training for deficiencies." Jimenez notes that several key policies can enhance the success of single-path coding, including guidelines for evaluation and management (E/M) selection for the facility component because "CMS Document Guidelines for professional E/M cannot be used for facility E/M services. … Coders [should also] have access to payer contracts to understand what can and cannot be reported for the professional and facility component." UCSD Health took a coder-centric approach to its single-path transition, which was driven by a desire to maximize resources by eliminating duplication of efforts. Doing so has enabled the health system—San Diego's only academic medical center—to keep pace with its rapidly rising coding volume while reducing its workforce by one-third, primarily through attrition. "We do have unfilled positions and, in anticipation of not needing as many coders [with single-path coding], we are using a fair amount of contract labor," says Cassi Birnbaum, MS, RHIA, CPHQ, FAHIMA, UCSD Health's systemwide director of HIM and revenue integrity. "We never want to be in a position where we have to lay anyone off, so this will also address our reliance on contract coders." Thus, while it was necessary to address the lack of a CAC solution in some specialty service lines by participating in beta testing of 3M's single-path coding platform, the health system's overarching implementation strategy emphasized training and credentialing. Its approach to training includes identifying proficiency gaps and addressing them with a combination of its online training platform as well as face-to-face education sessions. But UCSD isn't stopping at training. "We have different credentialing requirements than many," Birnbaum says. Facility coders must earn AHIMA's Certified Coding Specialist (CCS) credential, and professional fee coders must earn the CCS or AAPC's Certified Professional Coder (CPC) credential. Specialty certification is also required. "We need to blend [coding proficiency] so those coders who are doing single path also need to get their specialty certification if they don't already have it," Birnbaum says, adding that "because the pay scale is different between pro fee and facility, we will certainly incentivize those who are doing single-path coding." Birnbaum says there is a robust implementation roadmap in place to transition UCSD Health to single-path coding across specialties. Plans call for coders to manage not only coding but also charge capture. UCSD Health does have an advantage over many other health systems contemplating the move to single path because its HIM department is already responsible for both coding and charge capture for its 1,500-physician clinical practice organization. However, it was still necessary to arm coders with the proper tools and support. This was resolved in part by participating in the 3M single-path beta, which provided access to the platform they needed with the added benefit of being able to contribute to its design. "There are so many more opportunities for coding and charge capture, so we were really able to make sure everything flowed correctly and tied back to our Epic system in a good manner," Birnbaum says. Radiology was a proof of concept for both single-path and professional fee coding with integration points from the radiology information system to the 3M system and then the passing of the codes/changes to their respective billing systems. It paved the way for the formal deployment of 360 single-path coding, which will take place in February and allow UCSD Health to continue expanding its single-path coding program from procedural and general surgery areas to more complex surgical cases. "We're saving those for last, but we are excited about venturing into those areas with single-path coding," Birnbaum says. "One of the other initiatives we want to wrap into this equation is risk adjustment coding and coding for HCCs." It's an ambitious program, but Birnbaum is confident that the return on investment will be worthwhile—a confidence supported by early outcomes realized in radiology. Performance is being measured based on metrics jointly developed with 3M: productivity, quality, clean claim rate, and denial rate. "Our productivity has already gone up 46%," Birnbaum says. "Our coders love it. They've gone from a primitive system of coding within the EMR to one with all the bells and whistles like suggested codes they can edit. They feel like they've gone from the Stone Age to modern day overnight." Single-path coding is by all accounts an idea whose time has come. But for all its potential, there are a number of hurdles that should be considered. One, according to Porto, is keeping coders engaged and maintaining proficiency to ensure they are prepared to meet new workflow demands. "Coders will need to be more versed in all types of coding and working edits," she says. "Additional training may be considered a drawback in some ways, but hopefully coders will also see this as an opportunity to increase their coding skills and knowledge, making them more valuable to the organization." On the technology side, Porto emphasizes the importance of adequate planning time, thorough vetting of coding, billing, and financial system functionality, and a clear understanding of where required data elements reside in those systems. "The more your entire IT/HIM teams know about the project, the data functionality, and needs of all systems, the less the chance of setbacks, delays, and/or surprises to your overall project plan. Look at the entire process from registration to revenue capture in your financial systems," she says. Birnbaum echoes the importance of ensuring adequate IT resources, as well as establishing metrics to track progress and evaluating single path's potential by talking with organizations that have already made the transition and with vendors about their technology solutions. The latter is particularly important "because right now, with all the EMR vendors, it's very siloed between professional fee and facility" coding capabilities, she says. Finally, be prepared to make adjustments to maintain both momentum and stakeholder engagement throughout what can be a lengthy process. "Make sure folks don't get burned out and make sure the organization understands the need for ongoing IT and project management support," Birnbaum says. "You also need to make sure your stakeholders are engaged and brought into the process early and often." Birnbaum points to UCSD Health's early experiences in radiology, where early single-path efforts caused a backlog in charge capture. The cause was later identified as going live while the new CAC platform was still undergoing fine-tuning during the beta period, a situation managed with open communications, proper management of expectations, and patience. "We know it will really help out with productivity and will hopefully reduce the costs of coding and charge capture. We know it's going to be a long road to get completely across the finish line, so we need to adjust to keep momentum up," Birnbaum says. Custer says, "Coding is not what it was five to 10 years ago. We have to look at ways to make things more efficient, and smarter coding with fewer resources is the key. Specialization and single-path coding are both important strategies for coding teams today."